Forage Bag – Free Pattern! Another free pattern for you! I’m excited to finally share about the Forage Bag pattern I designed to go with my new fabric collection, Forage. I should have shared it a few weeks back, but better late than never, right?! I hope. After finalizing Forage, it was time to dedicate my efforts to designing this new pattern. I had so many ideas for different designs that it was hard to nail down just one. I guess that’s a good problem! Although, sometimes I wish I could make up my mind a little easier! This is a sweet little set of bags with a zippered opening. It’s kind of like having an extra pocket instead of carrying a whole purse full of things you rarely use. Not sure if you’ve noticed, but I’m heavily on the side of not carrying a lot of things with me. I like to travel light and not feel encumbered by a large bag or purse. Of course there can be exceptions to my own rule, especially for road trips and weekend getaways — so the Forage Bag is an ode to traveling light! It’s a fairly straightforward pattern that uses small amounts of fabric – which is always fun. It’s also perfect for mixing and matching your favorites. I love that! I think it’ll look amazing in so many fabric combos. I love that quality because sometimes you just want to sew! Agonizing over fabric selection isn’t what it’s all about anyway. 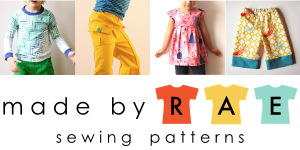 So be sure to stop over to the Robert Kaufman site to pick up your free copy of the pattern. It comes in two sizes, regular and mini. The regular size has a slip pocket inside, and the mini is perfect for a small wallet/phone and keys! Make sure to whip one up! Or two! I think they’d make a great present or treat yourself and make one for you! As always, thank you for supporting my work. I could not do what I do without the support of all of you. Thank you! Grommets: I highly recommend the Dritz brand grommets, pick them up at your local quilt shop or local craft supply store. Love the free pattern. However, it would have been helpful to have more pictures for those of us who are visual learners. Thanks for your comment Edith. And WOW! The file on their site is missing half the illustrations. Working on getting them to fix it as soon as possible, so hang in there! Awesome new bag design Anna! I love it! I have been unable to download pattern, please help! If I don’t down this from the site cuz it is missing things, then how do I get this great pattern? Please help me. Love this bag.! I can’t wait! Love the bag. Need info on how to download! Looking forward to sewing this bag! Thankyou so much! But when and where can I download please? Have not seen this fabric line before; so glad you and this pattern popped up this morning; the fabric look great; really like the look of the designs. And pattern looks fun too; will watch for confirmation that pattern download is fixed. So happy to have found you. Yay! I feel like all my Christmas’ have come at once – two new bag patters in a matter of weeks! I’ve purchase Fika Tote and now downloaded the Forage pattern. Which one to start sewing first?! So excited! Darling bags. I made my first sling bag about a week ago and have gotten so many complimentary .Now lll have to try another. What I like about this one is that I don’t have to buy any special hardware. Thanks for that. I’m loving the simple knotted handle .